Some people live in a house. Other people live in an apartment. Steve, the main protagonist of “Blue’s Clues,” lives in a picture book. The setting of Nickelodeon’s “Blue’s Clues” is just one of the early signs of the hit children’s show’s anti-conformist agenda. In the ‘90s and ‘00s, Nickelodeon marketed the show toward children, but its target lied on the unknown lives of single, heterosexual straight white men. But there’s a catch: Steve isn’t just like the millions of other white men overly represented on mainstream TV. The man obsessively talks to a cartoon dog, a coffee table and a comically large bar of soap every day. The show is a Kidz Bop version of Charlotte Perkins Gilman’s “The Yellow Wallpaper” combined with the detective series “Columbo,” as Steve has to conform to domestic pressures while solving meaningless mysteries. The show provides the classic set up for early ‘00s entertainment, too, completely glossing over the Iraq War in favor of celebrating the “birth” of a paprika shaker. But it’s not the show’s fault, it’s the viewers. Their docility compels them to follow Steve’s command to “come on in” to the picture book from the very beginning. And once inside Steve’s fantastical world, the viewer is chained to a destructive mis-reality. Anytime Steve wants to do something, for instance, he asks his imaginary cartoon dog, Blue, for advice. Blue then jumps to the screen, slapping the viewer’s peripheral with a dark blue paw print. “Blue said she wants to play ‘Blue’s Clues,’” says Steve, who is apparently bilingual in English and dogish. Steve, who appears to be unemployed, then sings a song and serenades the viewers he locked into his house. From here on out, the mind control begins. He then sings yet another song, doubling down on the contortions he’s enwrapped viewers inside, before he aimlessly searches his house for an unrealized answer. But Steve’s answer won’t come from peeling back his illustrated house, layer by layer. Instead, it comes from his tedious notes and etchings in his “handy, dandy” notebook. Whether or not Steve needs to take notes while looking for things during a 14-minute episode is beyond me. Still, his cartoonish depictions might reveal his backward views and inherent biases. He often heads to his kitchen, to talk with French-speaking condiments like Mr. Salt and Mrs. Pepper. He hides all the European characters in the back of his house, out of plain sight, so Steve’s Ameri-centric, nationalistic views are on full display. Perhaps, the mailbox is really saying “male time,” as if his time with Steve relies on “male” men delivering “male” to the parcel-carrying “male” box. What results from “male time” is a broken uni-gendered world, which ignores female-focused needs of canines such as Magenta and Blue. The mailbox delivers dozens of letters to Steve each day, but there’s no basis to how the letters got to Steve’s house. Every postage simply reads “stamp,” and written addresses are replaced by stick figure drawings of Steve and Blue. And in case Steve’s unlearned mindset toward the U.S. postal system isn’t enough, he decides to add another layer to his trouble. After “male time,” Steve jumps into yet another picture book, which is a picture book inside a picture book. He calls this veil for escapism his “blue-ska-doo.” In the ‘doo, Steve winds himself up and gets lifted into a world within a world. Steve, clearly, wants to escape from his life of household chores and unemployment: life — as “Blues Clues” so accurately depicts — of struggle, heartache and misery. He sits down into his “thinking chair” to contemplate his failures, but whimsically clears himself of all social responsibility. And if doing nothing wasn’t enough, after roughly 100 or so episodes, he decides to abandon his animated sorrows. He parades in another undistinguishable white male — Joe — to take his place in the home, and he sails off on his way to college. If public institutions are now letting in people for solving “clues” within their home, taxpayers may want to start protesting any free SUNY tuition proposals. Steve, however, is a matrix breaker. He single-handedly constructed a world in his head and used it to get back on his own two feet after years of idleness. 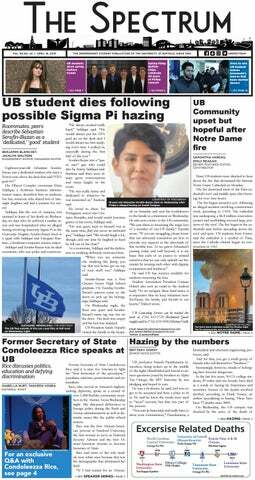 Benjamin Blanchet is the senior features editor and can be reached benjamin.blanchet@ubspectrum.com and @BenjaminUBSpec on Twitter.